War memorials have often become little more than painful reminders of Soviet rule for Eastern Europe countries that threw off their communist shackles in the late 1980s and early 1990s. Having also become fair game to graffiti artists, their future remains a thorny point of discussion. Built to mark and commemorate the tenth anniversary of the Russian 'liberation' of Nazi-allied Bulgaria in 1944, the giant Soviet Army monument in the capital Sofia, is still regarded as a prime example of the forceful socialist-realism of the period. 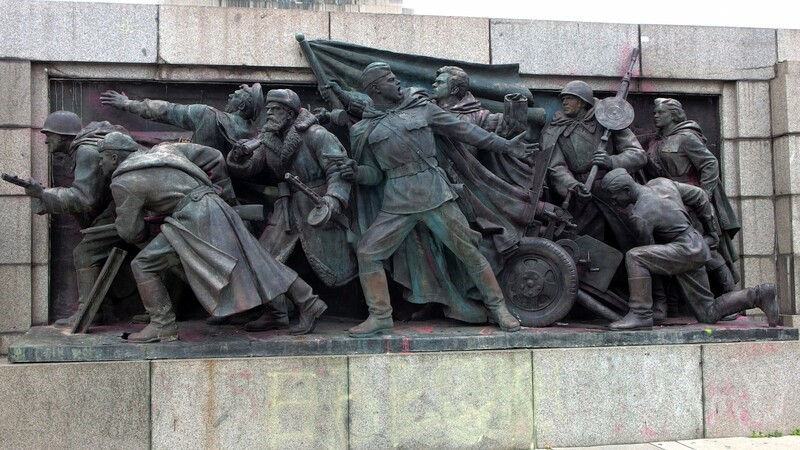 The high-relief statue, in which a Red Army soldier guides gun-waving soldiers and members of the proletariat, has therefore also become a target for many, who want it demolished. 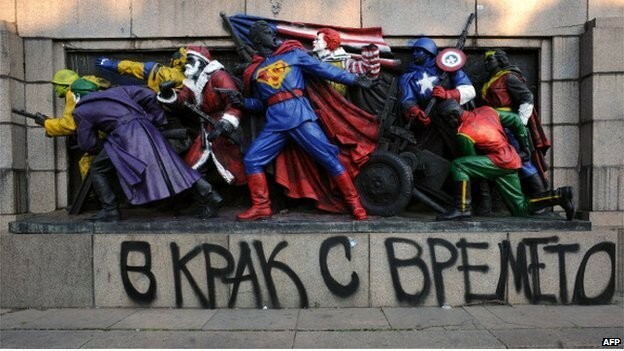 On June 17, 2011 the monument was painted overnight by a group of anonymous artists who call themselves Destructive Creation, and turned it into a Pop Art tableau of storybook characters, popular superheroes of mainly American origin. Taking center stage was Superman with his distinctive cape and blue. To the left was Santa Claus, about to look through a pair of binoculars. To the right was Ronald McDonald, the mascot of the fast-food giant McDonald’s, clutching a beer bottle. Captain America and Batman's sidekick Robin completed the composition, while Joker also made his appearance. 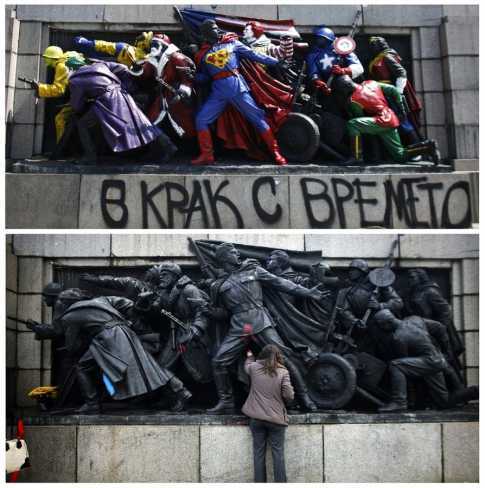 Below, a caption -spray-painted in black- read, in Bulgarian: "Moving with the times.” The Guerilla action perfectly captured the state of affairs in Bulgaria, split between the system of old and the new, Capitalist one. 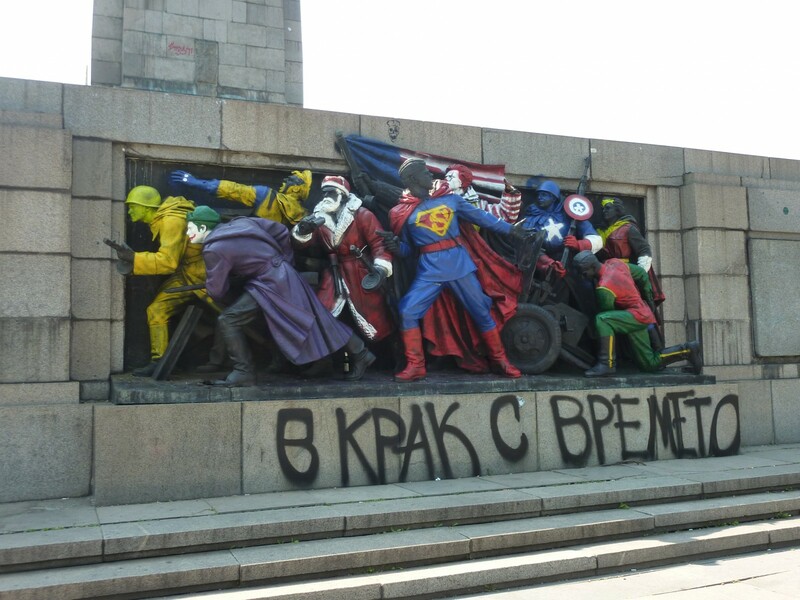 Only hours after the painting’s appearance, the revamped monument had regained its long lost status of a tourist magnet. 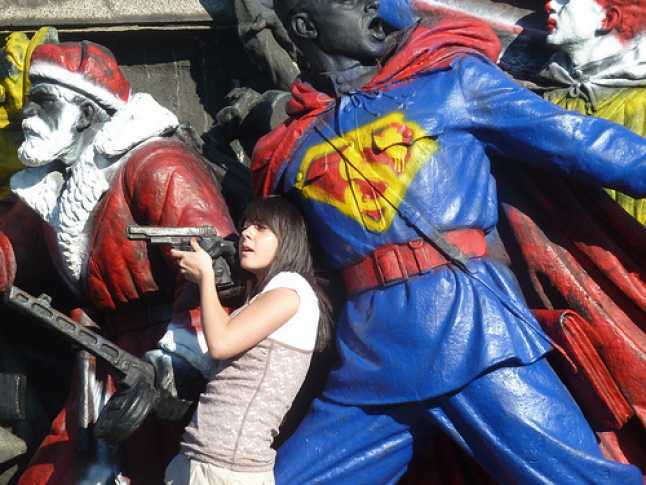 But Moscow was far from pleased. The benign if motley bunch were enough to provoke an international diplomatic rebuke. Three days later, the colorful and impudent paint was removed. Five years after Max Borka and Mapping the Design World included this urban intervention in a worldwide and groundbreaking overview of the latest in social, critical and experimental design, the exhibition Now and Then at the state of DESIGN, BERLIN 2017 festival goes on the search for what happened to them since then.